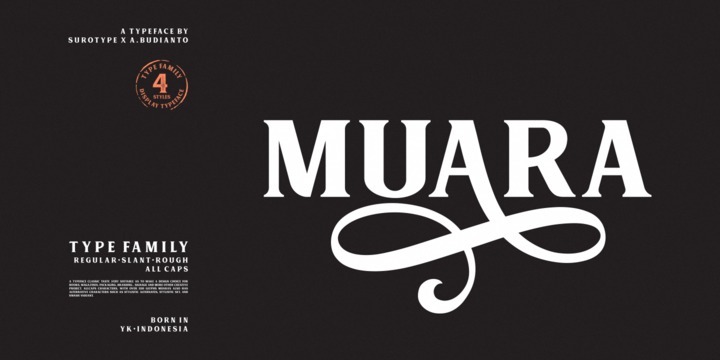 Muara is a calligraphy typeface created by Adil Budianto and published by Surotype which is available in 4 styles, over 330 glyps and a wide range of OpenType features. This vintage font with a classic look it was designed to be suitable for any kind of creative projects such as book cover, packaging, signage, logo, magazine but also for branding. To use all OpenType Stylistic alternates you need Adobe Illustrator CS, Adobe Indesign & CorelDraw X6-X7 or other program that support OpenType features. Enjoy! A font description published on Wednesday, January 31st, 2018 in Adil Budianto, Fonts, Surotype by Alexandra that has 2,756 views.